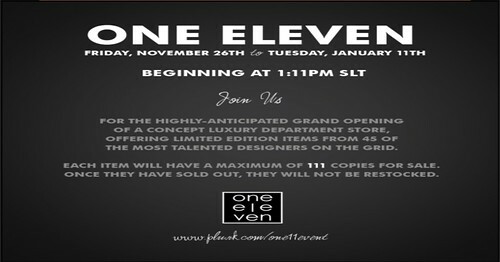 There has been lots of talk about One11Event, or One Eleven, however you want to say it – for the past few months. 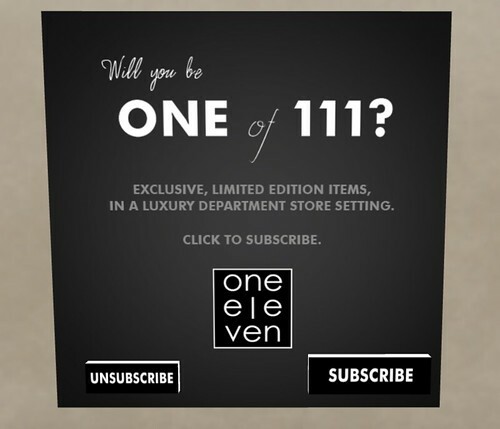 The concept is one that has been bandied about many times over the years, but this event is a touch different in the fact that the 111 is going to be how many of each designers items will be for sale GASP! You read correctly, over 40 incredible designers have gotten together under one apparently amazing rooftop – to do a one time only release of an item, and only 111 will be available. The organisers have done as much as they can to make the event as low lag as possible, from using limited textures, as well as setting up a room you can tp to early so you can load them prior to the event. While you are there you can click and join the sbscriber kiosk they have set out, and get the heads up on the landmark to the official event tomorrow when it is opened to the public. The plan time wise is of course 1.11pm , which is exciting. I suggest working out what time that is in your own time zone, so you do not miss out. The event is planned for a month, but with only 111 items from each designer, I kind of give them 2-3 days to sell out. If you want a sneak peak at some of the items up for grabs, then check out their website HERE . Good luck, and if you grab some of the goodies, let me know in comments, I would love to hear how exciting it is to get in and grab as fast as you can, kind of like the real sales for black friday, seems people are camping out up there already.